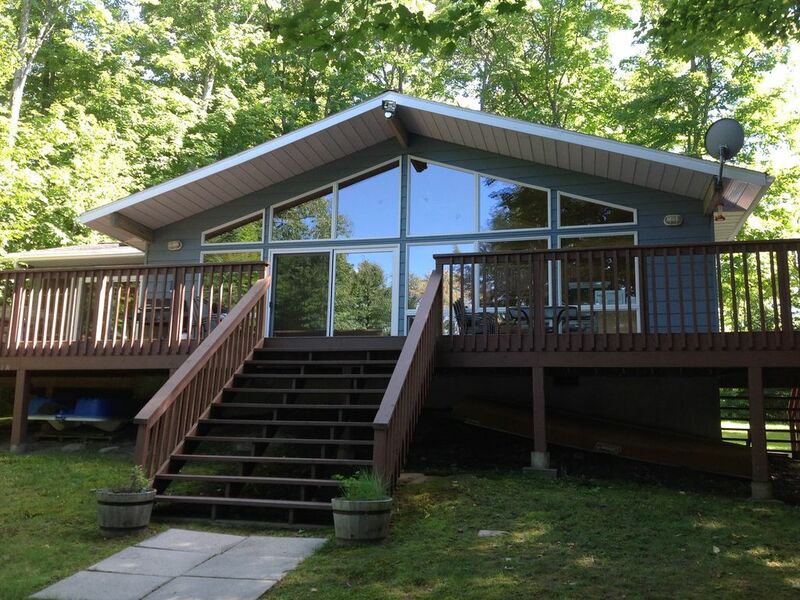 3 Bedroom road access cottage with 250 Feet Waterfront. Large Muskoka room. Whitestone Lake cottage. Situated on 1.8 acres with road access. Dock on property. Clean water for swimming. Deep water for boat docking. Canoe, kayaks, and paddle boat available. Large wrap around deck facing water. Three bedrooms - 2 queen beds and a bunk bed. Pull out couch sleeps two additional guests. Fully equipped kitchen. One bathroom and out house. Propane gas fireplace and new Napoleon BBQ. Fantastic. NOTE: Price listed is in US dollars. Canadian dollars rental price is $1800/week in high session, and $1000/week in low season. Please ensure you select Canadian Currency when determining rental price. Vacationer supplies their own linens: sheets and pillowcases, inside towel and beach towel, and tea towels. We loved the cottage. The beds were comfortable and there were extra pillows and blankets if needed. The living room was furnished with two deep, comfortable couches and a large television. The kitchen is well appointed and the table large enough to seat everyone. There is a wall of windows overlooking the lake allows for lots of light to come into the cottage and a great view of the water and dock area. There is a supply of food available for the many birds, chipmunks and squirrels around the cottage. We spent a lot of time watching and enjoying the wildlife. While the cottage is located a few kilometres down a windy gravel road, it was easy to find. The swimming was great and there is a ladder on the dock to get in and out of the water. We enjoyed our week and would return if we were visiting the area. Thanks Gary. Thanks Susan for the great review. We are very glad that you enjoyed your stay. Thanks for feeding the wildlife and leaving the cottage in pristine condition. Glad you enjoyed the lake. The cottage was such an amazing place to stay and spend some family time at the end of the summer! We couldn't stop saying how much we loved it the entire week we were here; everything was thought of, clean and cozy, and felt so much like home. The lake was stunning, and sunsets were so beautiful; there was so much to do; paddle boarding, kayaking, canoeing and swimming, as well as some awesome views from the lake. Thank you guys so so much for having us and giving us such an awesome week in the sun!! We will definitely be booking again next summer! Glad you and your guests enjoyed the cottage. Thanks again for leaving it in excellent shape. The cottage was amazing!! We had a great time. Water front was gorgeous and I couldn't bring myself to come out. I really wanted to stay for another week. Two couples shared this lovely cottage for a week and it offered something for everyone. The dock was a perfect place for lounging in the sun, swimming, evening cocktails and tying up the runabout boat we trailered to the lake. It was also a fantastic place to see the star filled heavens and Milky Way on a very clear night. There are many bays, coves and islands to explore on the lake. On our rainy day, the living room was a great place for card playing, movies on the big screen TV, and communal working of the newspaper crossword puzzles. The bedrooms were comfortable and the evenings very quiet. Nearby towns offered very nice restaurants and even 5 pin bowling in Burk's Falls. A fun outing is a trip to the chutes on the Magnetawan River on nearby Poverty Bay, a scenic combination of rapids and a waterfall. You definitely need a car to get around. The kitchen has everything you need and provides an excellent perch for drinking morning coffee and looking out to the mist rising off the lake and woods. I can't imagine what more a person could want in a lakeside cottage. We had rented this lovely cottage for a quick getaway. It was super clean and well stocked with dishes, cutlery, blankets, etc. Satellite TV and a great BBQ. This cottage has everything you need to enjoy your stay. The canoe was great, the lake was easily accessible and sitting on the dock in the sun is lovely. Easily sleeps 7. Bring good walking shoes as there are many trails to discover. Whitestone Lake Resort is close by and offers great dinners as well.